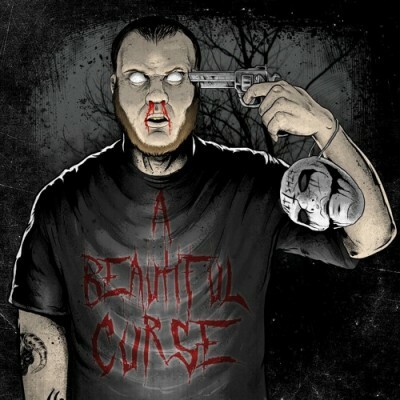 For those of you who are familiar with Dark Half, Geno Cultshit‘s solo album A Beautiful Curse has been a highly anticipated release from the LSP camp. After Geno’s unfortunate and untimely death last summer, there was doubt if the album would ever be released at all. But thanks to the support of his label, and the desire of his fans, we all get to take a peek into the pained and troubled mind of an underground great who was gone far too soon. In short, I found this album to be excellently written and performed, though uncharacteristically personal and often very painful. The majority of the songs discuss the mental and emotional aspects of substance abuse, depression and OCD, and the despair and anger that accompany them. The emotions are undeniably real, and are expressed with a gritty elegance that makes you truly feel how painful his experiences must have been. This is not a fun album. This is not a happy, feel good album that provides a soundtrack to a day at the beach. But dare I say that it’s a NEEDED album…an album that shows the true pain behind addiction, without a candy coating to sell albums and appeal to fairweather fans. It’s an album that many, many people will identify with, and one that I hope will inspire people to seek help if they feel similarly. The next song to catch my ear was “HER (Heroin),” which is essentially a very candid conversation between Geno and his desire to do heroin. This track in particular seems very real to me, like this could be an actual conversation between anyone and their respective addiction. It will likely hit close to home for anyone who understands his struggle. It’s an excellently constructed song, and is one of my favorites from the album, despite being so dark and emotional. Beyond these two songs, the rest of the songs deal heavily with depression, the desire to commit suicide, feelings of loneliness and many other painful emotions. “Run Along” (the only song thus far with a video) is slow and melodic, and is probably the best at showing off Geno’s absolutely amazing voice. “Darkness Within Me” has more of a rock sound to it, but also contains some very specific references to how he might want to kill himself. “Everyone Moves On” is a song that suffers from an overly simple beat and lackluster production, but has the same intensity and emotion to the lyrics as the others. The delivery of his message is so raw and angry, and the intensely personal nature of the song just punches you straight in the gut. “Sing for Me” and “Killing Autumn” are both haunting in their honesty, and are very powerful in making you think about the realities of the pain Geno lived with. They’re both just sad and tragic, and honestly, they would be quite difficult to listen to if I was a personal friend of Geno’s. “Killing Autumn” is quite possibly the song on the album that says the most, in a way that is uncommon even among other artists who also pour their souls into their music. Every word of the song is channeled from his experience, and is presented as though he is talking directly to the listener. There aren’t any fancy metaphors, and there’s no fictional storytelling to be heard. It overflows with an honesty that simply can’t be fabricated by someone who hasn’t been there and lived through the worst of depression and OCD. It’s a truly amazing song, though almost uncomfortably real, and unapologetic in it’s honesty. Overall, this album is amazingly well written and performed, and is personal on a level that most albums never approach. That being said, I certainly don’t want to sound like I am glorifying suicide, depression or anything else by praising this album. It can be a very difficult and emotional album to listen to, and could potentially trigger similar emotions in the listener if they are in a similar situation. This has the potential to be an album that opens peoples eyes about the terrible reality of mental illness and addiction. At the very least, I feel that it does an excellent job of bringing these issues to the forefront of conversation, and can hopefully relieve some of the stigma around asking for help when it is needed. If anyone reading this review or listening to this album is having thoughts of ending your life, please reach out for help from a trusted friend or professional. The National Suicide Prevention Lifeline can be reached at 1-800-273-8255. As one of Geno’s close personal friends who was there in the hospital by his bed during his last days with us. I don’t really know what to say at this point. It’s because of him and Damien that I was given a chance to work with the Cult Crew and Lyrikal Snuff Productionz. He was truly an amazing person and whether or not your a fan of Dark Half you need to hear this album. The passion and emotion he put into this record and all of his music is the real reason he will live on forever. I won’t reveal anything too personal about him but when he was recording a project it was almost guaranteed that I would receive a phone call in the middle of the night from him. He was constantly questioning his talents and whether the fans would like it. He literally poured his heart and soul into everything he did. This review sums up the album wonderfully. It is a chance for the fans to get inside of Garrett’s head and get a glimpse of what we knew he dealt with everyday. This has been the hardest project that all of us at LSP has ever done. I can only pray that we never have to do anything like this again. Thank You to the brothas n sistas here at Faygoluvers for this. The efforts of yall are much appreciated…Albums a straight up Masterpiece. I was personally listening to at least 5 Dark Half songs every day when he passed. Just on shuffle. I listened to Lonely Road so many times with in that year. His music did matter a lot to me. It made a huge impact on me as well. He will forever live on through his influence. I just wish he knew that.